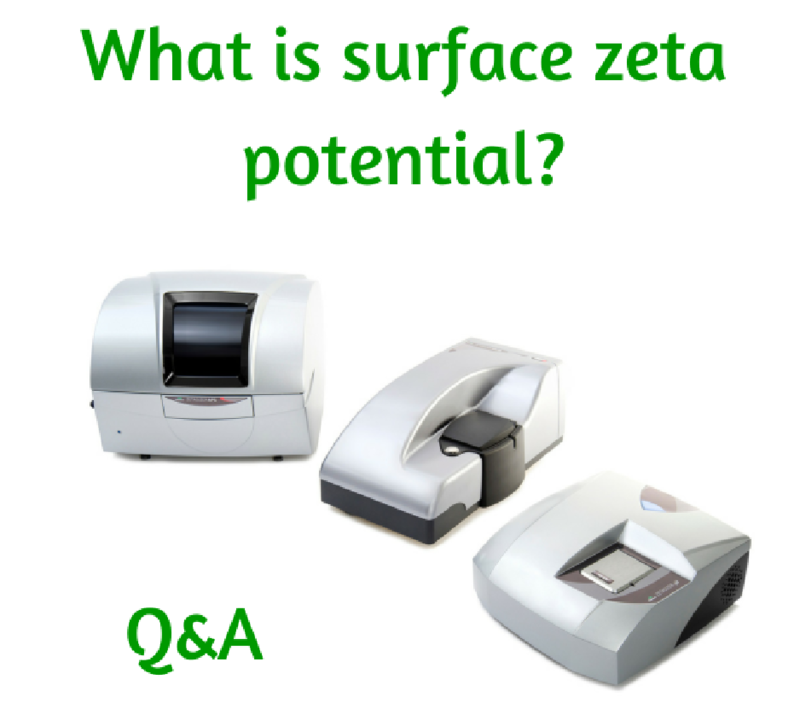 Recently, I hosted a webinar which discussed what surface zeta potential is and how it can be measured. The webinar attracted huge interest and it was a pleasure to see so many people attending and asking some excellent questions. In fact, there were so many questions asked, that we ran out of time at the end of the webinar and had to answer many of them via e-mail. Some of these are listed below. 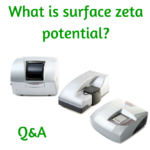 The webinar discussed the zeta potential of solid, planar surfaces (rather than colloidal dispersions or molecular solutions) and highlighted how the surface zeta potential cell accessory, for any zeta potential capable Zetasizer Nano, can be used to measure it. Some recent applications of surface zeta potential measurements were then presented which included PTFE, silica, porcine skin and membrane filters. 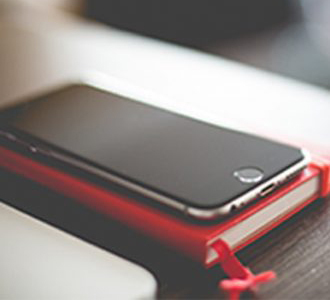 Q: How big is Electro-osmosis (Eo) compared to Electrophoresis (Ep)? How do you differentiate them? Any difference between Eo and Ep will depend upon the sample surface being measured and the dispersant in which it is immersed in. For example, if the sample surface being measured is neutral in the chosen dispersant, there will be no electro-osmosis. 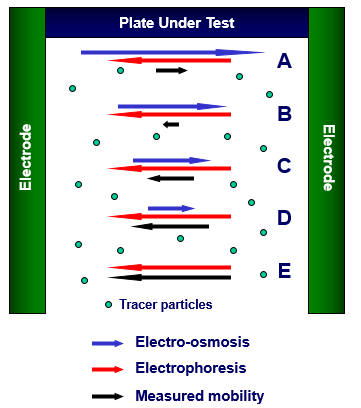 Therefore, the mobility of the tracer particles will be due to electrophoresis only. We differentiate between Eo and Ep by the frequency of the field we apply. The time in which it takes for Eo to become established is in the order of milliseconds. The time in which it takes Ep to become established is in the order of microseconds i.e. there is a magnitude of time difference between them. 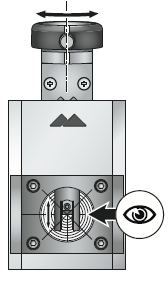 Therefore, at positions close to the surface of the sample (e.g. positions A to D in the diagram below), we apply a slow reversal of the field to induce both Eo and Ep. Remember that the Ep is constant at all measurement positions – only Eo will vary. We then take a final measurement, typically at 1000microns (i.e. 1mm) (position E in the diagram) away from the surface and we apply a much quicker reversal rate of the field so that only Ep is measured. This Ep value is then subtracted from all of the other measurement positions’ mobilities so that we know how Eo varies with distance away from the sample. Yes, the Zetasizer Nano product range incorporates dynamic light scattering (DLS) for size measurements, electrophoretic light scattering (ELS) for zeta potential measurements and static light scattering (SLS) for absolute molecular weight measurements. DLS is very sensitive to the presence of aggregates/large particles as they scatter significant levels of light. 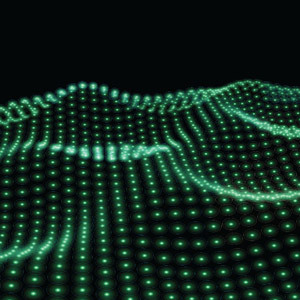 ELS can provide insights into the mechanisms of aggregate/floc formation. The minimum concentration of the chosen tracer can be determined by performing dynamic light scattering (DLS) size measurements at the forward angle (13°), checking the derived count rates (in kilo counts per second) and determining the excess scattering produced (i.e. the intensity of scattered light of the tracer suspension compared to the intensity of scattered light from the dispersant on its own). Working with a low tracer concentration should minimize the interaction with the sample surface under investigation. When we prepare tracer particles, we try to ensure that the attenuator chosen is position 11 (i.e. 100% laser power) and that the mean count rate is between 100 and 200kcps – water on its own will give very low count rates at the forward angle (typically less than 10kcps is the water is particle free). We can work at lower count rates than the 100 to 200kcps range. However, the lower the excess scattering, the longer the measurement will take as the signal to noise will be poor. Q: How important is establishing zero position and how you can make sure it is done properly. what would be the value count rate which translates to zero position? It is important that the zero position is accurately determined. We have two steps to establish the zero position with the surface zeta potential cell. Firstly, the surface zeta potential cell kit contains a coarse alignment tool which is used to roughly find the zero measurement position. Secondly, we use the count rate meter in the Zetasizer software to accurately establish the zero measurement position. This procedure can very accurately ensure that the zero measurement position is located. Yes, you are correct – the tracers do not have to be charged. Remember that the only purpose of the tracers is to scatter light so that the electro-osmotic and electrophoretic contributions can be determined.